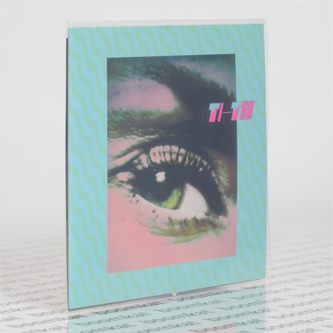 **Limited to 500 copies with hand-numbered insert and 7"** "Ti-Tho was an early to mid 80’s NDW-project by Marisa Calcagno and Thomas Stelter. The name Ti-Tho is a combination of Chrstina Marisa and Thomas. 7 exciting years between school and recording-studio followed. They both met when she was 13 and Thomas being the guitar-teacher of her friend Oliver with whom she had a band called 'Tempelfreuden' (together with Markus Lipka and Johan Pop) Thomas, who had followed some of their band-gigs then asked her to join in his new project as singer. After years of piano-lessons the relatively shy Marisa agreed and was then able to use her tough skills on a Keyboard, writing lyrics and singing. At their first rehearsal they didn’t have any lyrics in mind so they took an Asterix-Mag with the title 'Die grosse Überfahrt'. She took the mag from the table and improvised. The result was their first ever recorded track 'Asterix' with many crazy lyrics and compositions to follow. The music-scene in Germany and especially the rising Neue Deutsche Welle (NDW) had been very open-minded and allowed the craziest projects to have open ears. In their lyrics Ti-Tho used their experiences of every-day-life, even different music elements like classic, Flamenco, Punk... Everything was possible and alllowed to be used and mixed. One of the very first fans and admirers was Alfred Hilsberg who back then was running the highly influecial ZickZack-Label and writing for Sounds-Magazine. He produced and released their first 7inch and got them a deal with Polydor to release three more 7"s, one 12" as well as a compilation-contribution on ZickZack and Polydor. An Lp produced in 1985 by famous producer Tom Dokupil (Siluettes 61, Wirtschaftswunder, Die Radierer, Die Partei..) was never released and is still waiting for release. Ti-Tho had several TV-appearances, performances and even music-videos in the early to mid 80’s. They even produced a musical called 'Dodona' performed at the Planetarium Hamburg. A musical so unique and passionate, that Marisa perform it to this day. Switching to a major-label pushed them into a commercial direction and need, suppressing their wonderful simplicity in sounds, their fantasies and artistic freedom and friskiness. This mill of ignorance in major-business lead to the loss of interest and Marisa started concentrating on her art-studies while Thomas moved to the country-side to re-start and produce new songs for Marisa to sing when ready. Unfortunately, the re-union never happened and since 2010 Thomas is now composing music in a different world, but he would be very happy with this release if still with us in this world. Marisa once said in an interview "all get younger", reflecting the times back then and the awareness of life and which Marisa has kept until today. Marisa is producing music again with her Berlin project - Pop Musik."